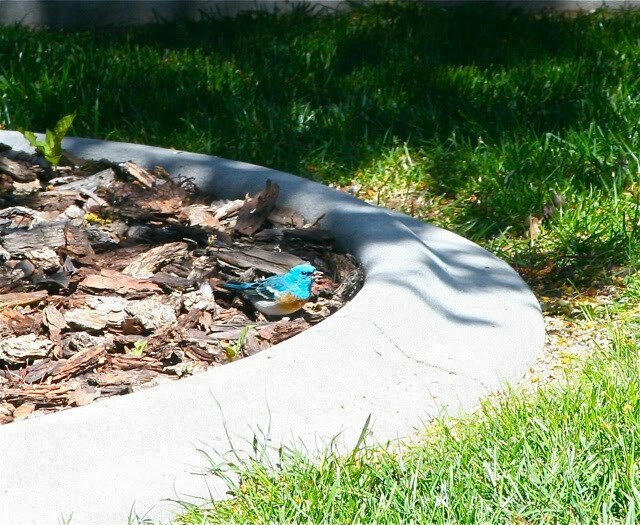 Since you know about local birds and I don’t, I thought I’d ask if you know what kind of bird the blue one is in the second and third pictures below. 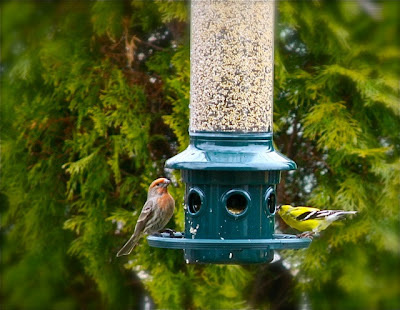 I get quite a variety at my feeders and I’m assuming the yellow ones are canaries and the red headed one is some type of finch. Also I wanted to know what kind of bird this striking orange and black bird is the last two photos. I love how his head is black and that he has a chunky beak. I sure am wasting a lot of time looking out my window lately....I need to get a super zoom lens to get better photos of my outdoor pets :). Do you happen to know the names of these birds? 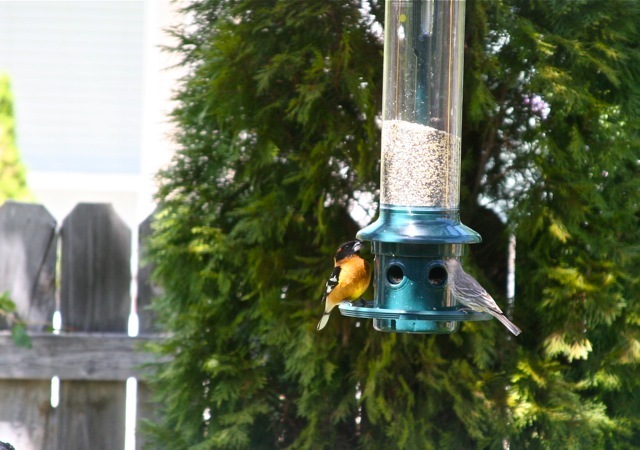 Awesome birds to have in your backyard and thanks for asking about their names! 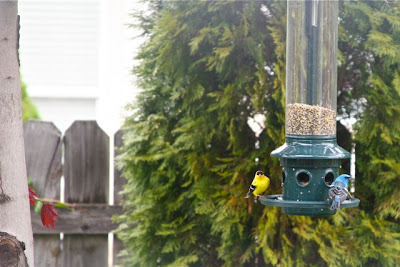 The yellow ones are in fact American Goldfinches. I think it has been typical for many folks to call any yellow bird a canary. The plain brown birds and the ones with the usually red, but sometimes orange or yellow wash on their faces are House Finches with the males showing the color. So you were right about it being "some type of finch". The blue one is a Lazuli Bunting. They nest in this area are one of my most favorite birds. Lazuli (pronounced LAZ-ew-lye or LAZ-ew-lee) is the name of the color of that particular shade of blue, like the gem stone Lapis Lazuli. 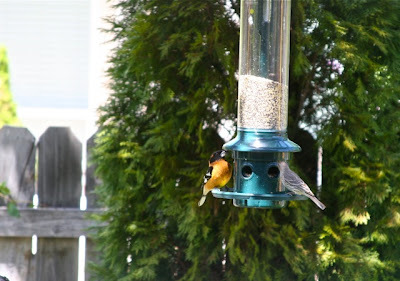 In the last two photos you have Black-headed Grosbeaks. Unlike humans, but like most birds, the male is the more striking of the two. It also has a nice shade of yellow on the lower belly. The "gros" part of grosbeak is Latin for big, large or thick, just like you described the beak. And it certainly has that big powerful bill for crushing seeds. Looks like you are getting plenty of red, blue, yellow, and orange at your feeders. That's what backyard bird feeding is all about! P.S. A male and female pair of Black-headed Grosbeaks just started coming to my feeder yesterday! I am happy to have them back. 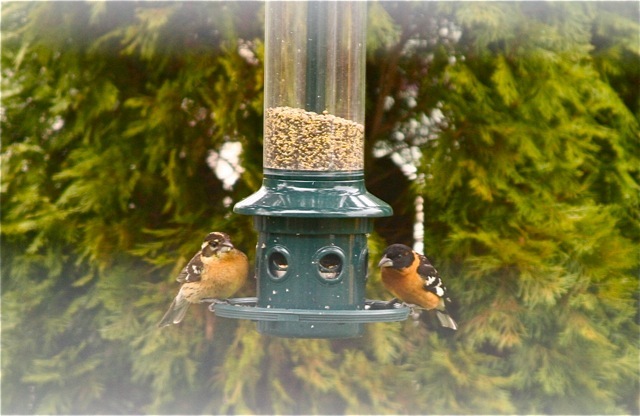 So, you and I both have black-headed grosbeaks! I have not seen any American Goldfinches in AZ yet but of course we get Lesser goldfinches all the time. We do have lazuli buntings but I have never seen any in Sycamore Canyon. BTW, I am not sure when you read my last post because your comment showed up while I was editting it, but I did further researching and decided that flycatcher was a "western" flycatcher. I was told we can get both pacific coast and cordilleran at this time of year so it could be either and as I did not hear the bird call I could not differentiate between the 2 species.